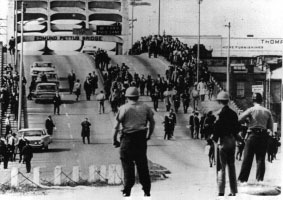 On “Bloody Sunday,” March 7, 1965, some 600 civil rights marchers headed east out of Selma on U.S. Route 80. They got only as far as the Edmund Pettus Bridge six blocks away, where state and local lawmen attacked them with billy clubs and tear gas and drove them back into Selma. Although the Civil Rights Act of 1964 legally desegregated the South, discrimination was still rampant in certain areas, making it very difficult for blacks to register to vote. In 1965, an Alabama city became the battleground in the fight for suffrage. Despite violent opposition, Dr. Martin Luther King Jr. (David Oyelowo) and his followers pressed forward on an epic march from Selma to Montgomery, and their efforts culminated in President Lyndon Johnson signing the Voting Rights Act of 1965. (CNN) “Selma,” the new feature film about the civil rights struggle, is igniting a struggle of its own over who deserves credit — or blame — in the events of 50 years ago that are depicted in the movie. “He always had this true, deep compassion to help poor people and particularly poor people of color, but even stronger than the compassion was his ambition,” LBJ biographer Robert Caro once said. “But when the two aligned, when compassion and ambition finally are pointing in the same direction, then Lyndon Johnson becomes a force for racial justice, unequalled certainly since Lincoln.” Source Time magazine. Look carefully at the map. Where did the march route begin? Where did it end? Use the map scale to estimate the distance between the two places. If average walking speed is 3 miles per hour, how long would it take to walk that distance? The movie paints a somewhat bleak picture of Lyndon B Johnson. Watch this interview with Woody Harrelson and Rob Reiner and write your thoughts about this. At 18:30 they talk about the transition from Kennedy to Johnson.